Imagine that ... we’ve redefined "eating out." 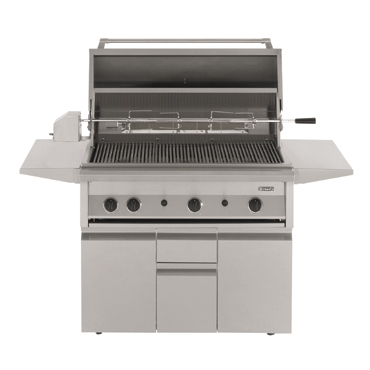 Our 42" freestanding grills allow you to take your talent outdoors to create whatever your heart desires - with 800 sq. in. of grilling area, tough Solid Brass cast burners, an infrared rotisserie burner, optional smoker drawers and an electric ignition. Of course, the maitre d’ will miss you. Heavy-Duty rotisserie motor assembly - 80 lbs.